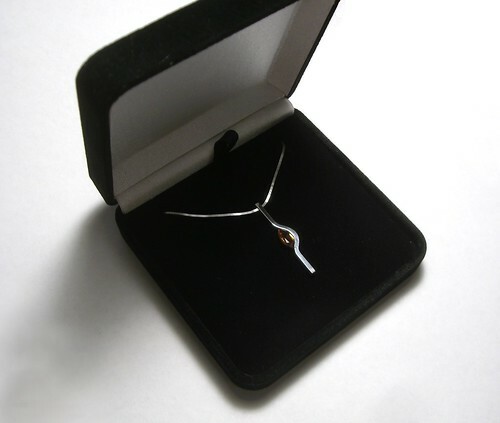 I made this surprising, minimalist pendant as a Christmas present for Flic. 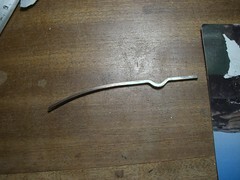 I started with a length of 2x2mm square sterling silver wire and formed this arc shape with a pair of round-nosed pliers. 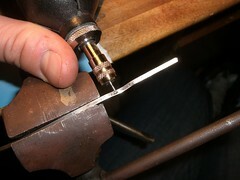 The fairly tight radius of the round-nosed pliers tended to mar the surface of the silver, so I should have used ring pliers or, better yet, made a hardwood press jig to joggle the arc profile in the vice. 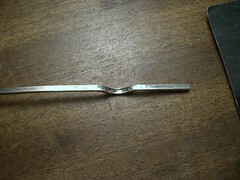 After a lot of adjustment I ended up with a symmetrical form, and removed the few dents with a little filing. 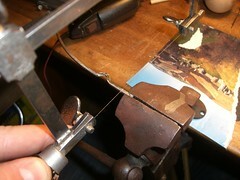 Next, I used a narrow disk burr to cut the slot for the setting. 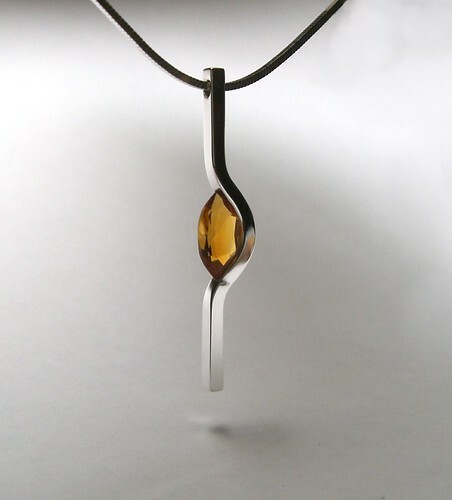 The slot is approximately 1.6mm wide, and 10mm long, to accept the 10x4mm marquise cut citrine. 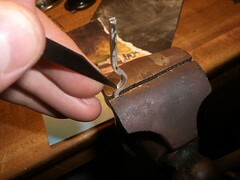 Here's the slot, after cutting with the burr. 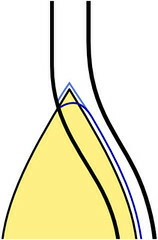 At this stage, the ends of the slot were radiused to the profile of the disk burr (dark blue line). They obviously wouldn't hold the pointed stone like this. The ends must be cut to meet the light blue line. I used a 0.8mm flat graver to make these cuts. 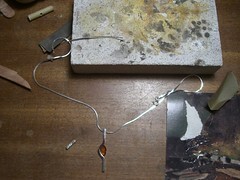 Next, I cut the pendant to length with a medium piercing blade and neatened up the ends with a file. 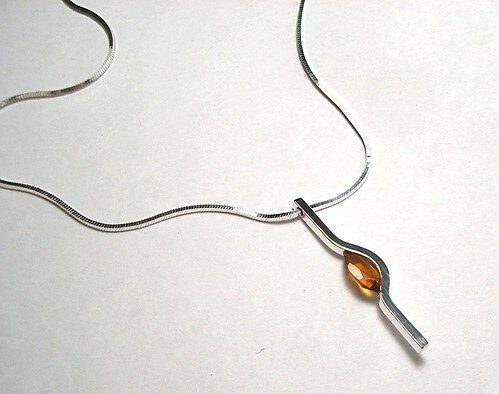 I selected a 0.9mm square snake chain to echo the cross section of the pendant. I drilled a 1.3mm hole through the top to accept it. I then elongated the hole along the vertical axis with a ball burr. This allowed the chain to flow through more freely. Unfortunately, I forgot to take a photo. I polished the pendant with wet and dry paper, followed by rouge on a felt wheel. Setting the stone was as simple as flexing the pendant between my fingers and slipping the stone into place. The stone does rattle a little. I toyed with the idea of adding a dab of shellac to fix it in place, but decided to stay true to the concept of the crazy setting and let mechanics do all the work. Ah! I could probably have laid a tiny leaf spring in the slot to push the stone up against the front face. A missed opportunity there. 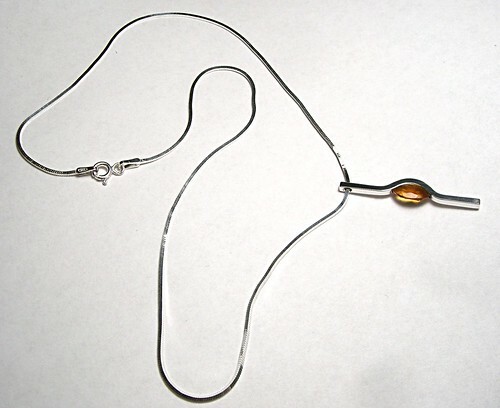 I desoldered the clasp loop to thread the chain through the pendant. 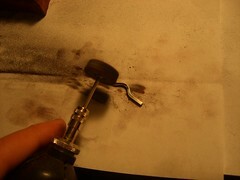 Here it is fluxed and set up to be soldered back into place. 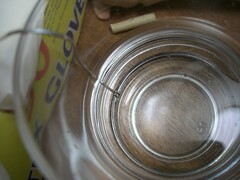 Finally, I pickled the loop to remove flux and oxide. Pretty pleased with this piece; I like the design, the experimental setting proved a success, and the whole thing even came together relatively quickly! Submitted by Anonymous on Wed, 06/08/2016 - 03:36. Howdy! purchase viagra online no prescription very good internet site. Submitted by Anonymous on Wed, 06/08/2016 - 08:41. Hi there! buy cialis , vardenafil , online mexican pharmacy , buy cytotec great website. Submitted by Anonymous on Wed, 06/08/2016 - 14:20. Hello there! buy viagra no rx beneficial website. Submitted by Anonymous on Wed, 06/08/2016 - 20:57. Howdy! viagra 100mg good web page. Submitted by Anonymous on Thu, 06/09/2016 - 04:48. Hi! tadalafil very good web site. Submitted by Anonymous on Fri, 06/10/2016 - 13:52. Hello there! buy generic acomplia great web site. Submitted by Anonymous on Fri, 06/10/2016 - 19:13. Hello! buy cialis , levitra , best online pharmacy prescription drugs , misoprostol excellent website. Submitted by Anonymous on Fri, 06/10/2016 - 19:18. Hello! buy acomplia uk great web page. Submitted by Anonymous on Sat, 06/11/2016 - 00:38. Hello! buy acomplia beneficial internet site. Submitted by Anonymous on Sat, 06/11/2016 - 11:43. Hi there! cialis , levitra , us best online pharmacy , cytotec good web site. Submitted by Anonymous on Sat, 06/11/2016 - 17:27. Hello! order acomplia good internet site. Submitted by Anonymous on Mon, 06/13/2016 - 20:39. Howdy! buy generic sildalis good web page. Submitted by Anonymous on Tue, 06/14/2016 - 10:45. Howdy! buy sildalis 100 mg excellent internet site. Submitted by Anonymous on Wed, 06/15/2016 - 00:15. Hi! generic doxycyline very good web site. Submitted by Anonymous on Wed, 06/15/2016 - 04:29. Howdy! buy generic doxycyline great web site. Submitted by Anonymous on Wed, 06/15/2016 - 16:48. Hi there! buy doxycyline no prescription excellent website. Submitted by Anonymous on Wed, 06/15/2016 - 21:37. Hi there! canada pharmacy online good internet site. Submitted by Anonymous on Thu, 06/16/2016 - 06:53. Howdy! online pharmacy vicodin very good website. Submitted by Anonymous on Thu, 06/16/2016 - 20:34. Howdy! cvs pharmacy online application excellent website. Submitted by Anonymous on Fri, 06/17/2016 - 02:21. Hello there! pharmacy technician school online great site. Submitted by Anonymous on Fri, 06/17/2016 - 22:56. Submitted by Anonymous on Sat, 06/18/2016 - 02:03. Howdy! buy generic clomid , pharmacy online usa , order modafinil , advair hfa great web site. Submitted by Anonymous on Sat, 06/18/2016 - 11:25. Hello there! online pharmacy technician program very good web site. Submitted by Anonymous on Sun, 06/19/2016 - 05:10. Hi there! buy clomid cheap , international online pharmacy , buy modafinil no prescription , buy advair usa great website. Submitted by Anonymous on Sun, 06/19/2016 - 11:31. Hi! clomid online , vicodin online pharmacy , buy provigil no rx , advair beneficial site. Submitted by Anonymous on Mon, 06/20/2016 - 01:56. Hello! canadian pharmacy online cialis great internet site. Submitted by Anonymous on Mon, 06/20/2016 - 07:38. Hi! legitimate canadian online pharmacies beneficial internet site. Submitted by Anonymous on Mon, 06/20/2016 - 12:01. Hello there! where buy clomid , best canadian online pharmacy reviews , provigil cheap , buy fluticasone salmeterol online good site. Submitted by Anonymous on Mon, 06/20/2016 - 13:38. Hello! canadian pharmacy no prescription great web page. Submitted by Anonymous on Tue, 06/21/2016 - 12:16. Howdy! where buy viagra good web site. Submitted by Anonymous on Tue, 06/21/2016 - 21:14. Hello there! purchase sildenafil very good internet site. Submitted by Anonymous on Tue, 06/21/2016 - 22:08. Hi there! order clomid , cvs online pharmacy , buy provigil online , advair hfa beneficial web site. Submitted by Anonymous on Wed, 06/22/2016 - 04:55. Hi there! buy clomid with no prescription , walmart online pharmacy , buy provigil , buy advair no prescription very good web site. Submitted by Anonymous on Wed, 06/22/2016 - 06:58. Hello there! buy cialis usa good web site. Submitted by Anonymous on Wed, 06/22/2016 - 12:54. Howdy! buy cialis cheap excellent internet site. Submitted by Anonymous on Thu, 06/23/2016 - 00:00. Hi there! online pharmacy technician beneficial web page. Submitted by Anonymous on Thu, 06/23/2016 - 08:58. Howdy! buy clomid medication , online pharmacy no prescription , buy modafinil no prescription , advair diskus very good web page. Submitted by Anonymous on Thu, 06/23/2016 - 10:26. Hi there! hydrocodone online pharmacy great web site. Submitted by Anonymous on Thu, 06/23/2016 - 15:50. Hello there! buy clomid cheap , caremark online pharmacy , buy provigil pills online , buy advair beneficial web page. Submitted by Anonymous on Fri, 06/24/2016 - 14:18. Howdy! cheap pharmacy online great website. Submitted by Anonymous on Fri, 06/24/2016 - 20:56. Hello! buy clomid , my canadian pharmacy online , buy provigil pills online , buy advair usa good internet site. Submitted by Anonymous on Sat, 06/25/2016 - 02:12. Hello there! klonopin online pharmacy good web site. Submitted by Anonymous on Sat, 06/25/2016 - 17:30. Hi there! pharmacies online great web site. Submitted by Anonymous on Sat, 06/25/2016 - 22:54. Howdy! online pharmacy technician program very good web site. Submitted by Anonymous on Sun, 06/26/2016 - 04:52. Hello there! pharmacy technician schools online very good web page. Submitted by Anonymous on Sun, 06/26/2016 - 04:57. Hello there! clomid , india pharmacy online , buy modafinil no prescription , advair online good internet site. Submitted by Anonymous on Sun, 06/26/2016 - 12:53. Hello there! cvs online pharmacy great website. Submitted by Anonymous on Mon, 06/27/2016 - 02:10. Hi! buy clomid pills online , ritalin online pharmacy , purchase provigil online no prescription , fluticasone salmeterol great site. Submitted by Anonymous on Mon, 06/27/2016 - 02:34. Hi! doxycycline online pharmacy great web page. Submitted by Anonymous on Tue, 06/28/2016 - 01:26. Hello! propecia very good site.